If you've used Facebook app ever then you must be knowing about this issue. One can't copy text from Facebook's application for Android, iPhone or Windows. Facebook has not provided any such option in their app to copy text. We can say that it's a drawback or bug of one of the most popular social networking app. We all are aware that to copy text on Android or iOS you just need to hold text for sometime and then choose the copy option from the menu appears. But this is not so with the FB app, on pressing or holding text nothing appears on the screen. You would feel that copy or paste option has been disabled. It happens many time when I am browsing Facebook on app and suddenly came across some awesome status but failed to copy it. At that time I need to open Facebook in my browser to copy specific post of status. It's a time-consuming process and if it was an important information then you have to either type it on switch to desktop version of FB. So I tried to get rid of this and found some simple tricks to copy text from Facebook app on Android , Iphone or Windows phone. There are mainly three ways (listed below in detail) to copy text from fb app. You can try them, all the methods are checked manually and working properly. These are some of the best working ways, Give them a try. Method 1: - There are some apps available which allows to copy text from any application installed on your mobile. You just need to install them first time on your Smartphone and that's it. They will enable copy and paste functionality even in Facebook mobile app. Just hold the text, copy it and it will be saved in your clipboard in just one click. Below I have added some such apps. Copy Paste: - It's an android app. Copy text from any application and paste it in "Copy Paste" clipboard with single click. Copy from "Copy Paste", the saved list in single click. Paste it where you need. Long press the item in the "Copy Paste" clipboard to edit, share and delete. FBcopyTXT: - It's an iOS app. 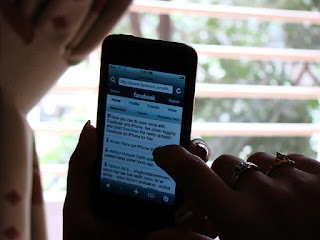 It's a simple tweak which let you copy Facebook posts texts with long press gesture. Simply long press on the post and you'll see actions options. Method 2: - To use this methods there is a requirement of Facebook Messenger app. You must install FB messenger on your Smartphone first to take benefit of this method. Once messenger app is installed follow the steps mentioned below. Open up your Facebook app and choose the post or status which you want to copy. Now simply press the share button below the status. Now again Click on Share and tap the "Copy Link to Post" option. After that open Facebook Messenger and create a new chat for yourself and paste the link copied here. Then Open that link in the Messenger. Now try to copy from here. You would be able to do it. That's it, you're done. Method 3: - It's another method to copy text but it is tedious for anyone. Just follow the steps mentioned below. Take the snapshot of the specific post you want to copy (You can do this by pressing volume key+power key simultaneously or you can download any screen shot capturing app). Now download any good working OCR (Optical Character Reader) app. You can go for Text Fairy. Now just open the screen shot in OCR app and process the text. Once the processing has been completed you can copy the text easily. So this was all about how to copy and paste text from Facebook app easily. If you've any other working method then mention it below in the comments. For any query or doubt feel free to leave below in the comment section.